Michael Steeb is an aimless twenty-one-year-old pot farmer in Central California in the 1980s. He has no real plans or interests . . . until the day he connects with memories of a life that seems to belong to someone else. That 'spirit' is Walter, a young American soldier killed in World War II. Michael's task is the near-impossible: to lead Walter's family to closure and peace, to deliver the real truth behind Walter's Purple Heart, and to somehow achieve the forgiveness absent for so many years so Walter can move on. Michael sets out to find Walter's best friend, Andrew, and Mary Ann, the fiancee Walter left behind. Mary Ann recognizes Walter in Michael immediately. But Andrew sets out to prove that Michael is the worst sort of con man. 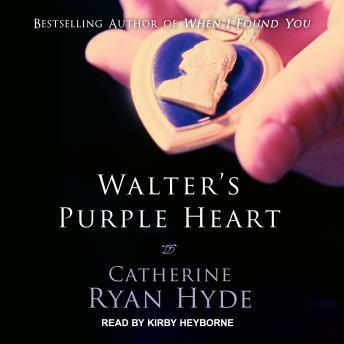 Narrated in large part by Walter from beyond the grave, Walter's Purple Heart is a fast-paced war drama and a deeply felt romance, with a unique twist on the prospect of multiple lives. Catherine Ryan Hyde paints an enduring portrait of a life prematurely lost, and the endless ripples of consequence to those who loved him, in a microcosm that sheds light on the true gravity of war.